March 30, 2011 in "do good"
"Bakers Wanted. Looking for bakers who would like to bake cookies to donate to feed the homeless." I am no Mother Teresa but every now and then I get this feeling like I'm so involved in my own little world. And little, it is. So... I jumped at this opportunity! But what to make? I assumed whomever would be receiving this probably comes across chocolate chip cookies and sugar cookies more than anything - if anything. Those are pretty standard. That said, I've been on a serious oatmeal kick lately. So... I made something that sounded good to me! (Hey - I said I was no Mother Teresa) So, here I have the recipe to share with you. 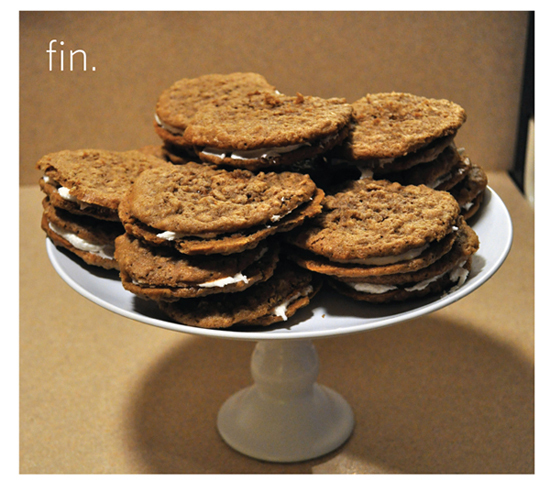 I hope you enjoy these Oatmeal Raisin Toffee Cookies. Found on Allrecipes.com. My only recommendation for this recipe: DOUBLE the amount of toffee. Other than that, they were DElish! (Not that I had very many, of course.) I truly hope that those who received them enjoyed them as much as I did! In a large bowl, cream together the butter, brown sugar and white sugar. Beat in the eggs, one at a time then stir in the vanilla. Combine the flour, baking soda and cinnamon; stir into the creamed mixture. Blend in the oatmeal and toffee bits. Drop by rounded spoonfuls onto the prepared cookie sheet. March 28, 2011 in "photo shoot"
Lately, my parents have been allowing me to borrow their wonderful Nikon D5000. By lately I mean the past two months... and by borrow I mean I haven't given it back. It's just soo nice to not be documenting my baking with my 5 lb. camera from 1995. (That's an exaggeration but only slightly.) So, to celebrate my recent acquisition - temporary though it may be - I've decided to share with you some photos from my kitchen. Enjoy! I don't want to give this camera back! Waaa! 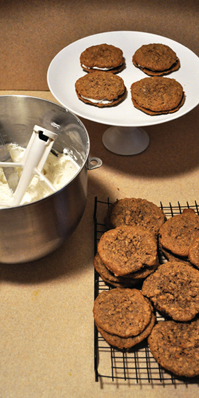 March 13, 2011 in "Oatmeal Cream Pie"
In the bowl of a mixer, cream together the butter and sugars. Beat in vanilla and the eggs, one at a time until well incorporated. Whisk together the flour, salt, baking soda, cinnamon, cocoa powder, and oats. Beat into the cream mixture. Refrigerate cookie dough for 15 minutes. Drop about 1 tbsp of dough onto an ungreased cookie sheet and bake at 350 degrees for about 10 minutes. The centers should still be slightly underdone when you remove them from the oven. Cool completely on a wire rack. Spread about 1 tbsp of cream filling (recipe below) on the bottom of one cookie and then top with another cookie. Also, this recipe has been added to my Recipe Box if you ever want to refer to it in the future. The Recipe Box is a great little place for super yummy recipes I share through out my blog. You should take a look!